Across the Abyss: What Would You Sacrifice for Knowledge/Da'ath/Gnosis/Power/Mystery/Wisdom? What Would You Sacrifice for Knowledge/Da'ath/Gnosis/Power/Mystery/Wisdom? It's been said that G-d lied to Adam and Eve, that he said they would die if they ate the fruit, but that they didn't... Oh, but they did die! But that's part of the point. First the "small deaths" of leaving the Garden, toiling in the field, and the pains of childbirth, then the "great death" at the end of their lives, Adam at 930 years old. What would you give up to gain Knowledge? What would you give up to become "like G-d", to become a god? Is the immortality of your physical body a sacrifice worth giving? They traded a posh (Port out, starboard home, around the Cape of Good Hope, for those who don't know) life of ease, caring for the trees but not working hard, but living in ignorance, for a life of toil and hard work and pain and eventual death, but gained Knowledge, Da'ath, Gnosis. How many Americans living a comfortable, easy life would give that all up for Knowledge/Da'ath/Gnosis? It's essentially the same story, sacrificing yourself to yourself on the tree, and gaining Knowledge/Da'ath/Gnosis/Power/Mystery/Wisdom. G-d mislead them by creating a taboo that the plan ultimately required to be broken. The serpent mislead them by making it sound like the promised death was immediate and absolute, rather than in the future and temporary. 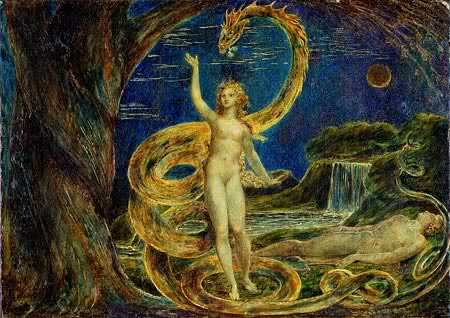 But ultimately, Adam and Eve made their own decision, not based only on what G-d said, and not only on the serpent. They gave up something to gain something else, and though they suffered the consequences, they changed EVERYTHING. They took their Destiny into their own hands and overcome Fate by breaking the taboo, while G-d and the serpent stood back to see what they would do.